Did you know that there’s a way to become even more productive as you’re powering through your task list? That secret weapon is known as “Batch Processing”. Currently as you move through your task list you’re probably using a Task Switching method, working on the list in some form of order of priority, not taking into account the “context” of the tasks. On the surface nothing seems to be wrong with the above list: You have all of the information you need to accomplish each task, you know who you need to contact and what you’re contacting them about so you should be able to blast through the items on that list in order in no time at all. Simple, right? Well, not necessarily! That seems pretty simple, until you realise that switching between each context is going to cost you precious time, and you’ll lose focus. Some studies have put the cost of task switching as high as 25 minutes of lost time as you stop what you’re doing, refocus and get going again and an article in Psychology Today puts the cost of task switching as high as 40% lost productivity. Even if it’s just 5 minutes per switch the going through the tasks above in that order you’d lose 25 minutes over those 5 tasks. So, what can you do about it? You can batch process your tasks to speed up working on them and cut down the switching costs. Following on from that, our 25 minutes of lost productivity has now gone down to just 5 minutes – all from a little rejigging of our list! Is Batch Processing Just For Email? No! I batch process all of my post, bills, cleaning – if you can think of it, you can probably batch process it!. I do batch process my emails once a week, they’re checked as they come in to make sure that nothing requires an urgent reply and then I go through them properly and action, file or delete as ncessary. Take my mail for example, I check it as it comes in to make sure it’s not super important and needs an immediate response, I’ll then put it in my in-tray so sort through and action or file as appropriate. Do you batch process or do you work through your tasks in order no matter what? 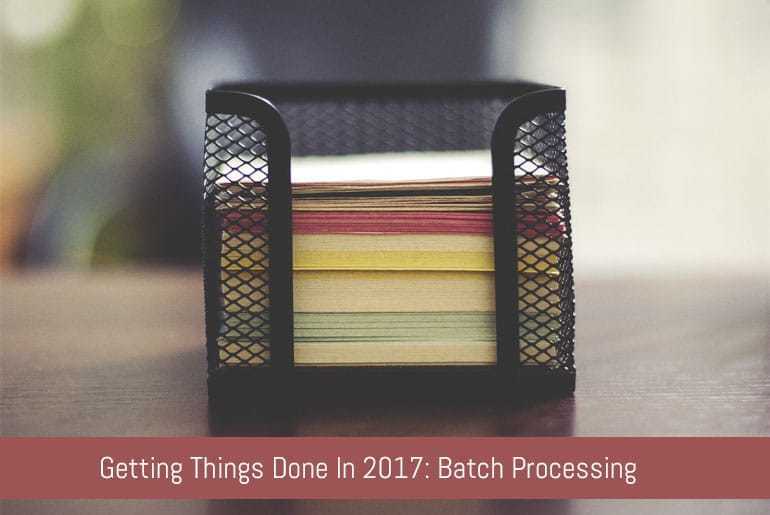 Let us know if you think batch processing will increase your productivity or if it will slow you down in getting through your. Drop us a note in the comments with your thoughts.